The 3rd Edition of the "Building of the Year Created With ALUPROF Systems"-Let the Competition Begin! | ALUPROF S.A.
Polish agglomerations have become increasingly crowded. New residential buildings and whole new districts are being created, often adjacent to historic city centres. Architectural practices are faced with the challenge to strategically redefine the urban landscape. For the third time, the jury of the “Building of the year created with ALUPROF systems" competition will select unique construction projects that set the direction of designing modern urban spaces. 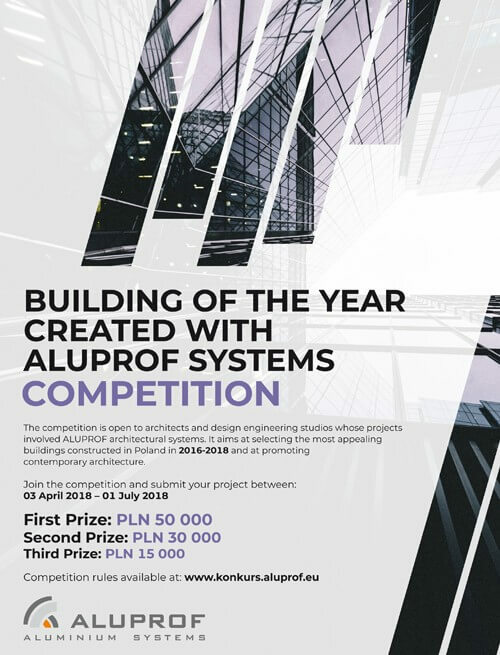 The 3rd edition of the nationwide architectural competition “Building of the year created with ALUPROF systems" begins on 3 April 2018. As before, it aims at selecting the most appealing buildings designed and constructed using ALUPROF systems in 2016-2018. The three winning projects will be awarded as much as PLN 50,000, PLN 30,000 and PLN 15,000 respectively. The competition consists of three stages. In the first stage, the organisers will select 50 projects that will qualify for the next stage. The jury will then select 10 best entries. At the very final stage, the jury will select the three winning projects. The results will be announced during the awards gala which will take place on 14 September 2018 at Warsaw’s Double Tree by Hilton hotel.